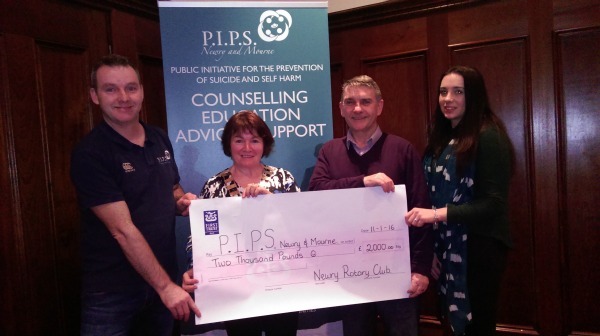 Pictured: Frances Caherty (centre) presented a cheque for £2,000.00 to Eamon Murphy, Seamus Mcabe and Laura McGuigan at the recent Rotary Club meeting. The funds were raised during a very successful 'Remembrance Tree' intitiatve held from 14-23 December 2015 in The Quays shopping Centre Newry. This event involved our volunteers participation for the 10 days leading to Christmas and working in conjunction with the local Kevin Bell Repatriation Trust.